Special Containment Procedures: SCP-2337 is to be kept in a standard avian habitat cell with soundproofing. Personnel are required to wear level 3B 5A 7A 26M ear protection while handling SCP-2337. Transportation for SCP-2337 is to be carried out using a portable soundproof crate. Though SCP-2337 has no need of nutrition, gummy worms1 are to be provided upon request, and not restricted as a reward for good behavior. Due to SCP-2337's poor grasp of cause and effect, punishments and rewards will inevitably result in frustration on part of involved personnel. As of 12/5/14, all staff are advised to not attempt to emulate SCP-2337's speech patterns in its presence, and are assured that SCP-2337 understands some degree of human English. 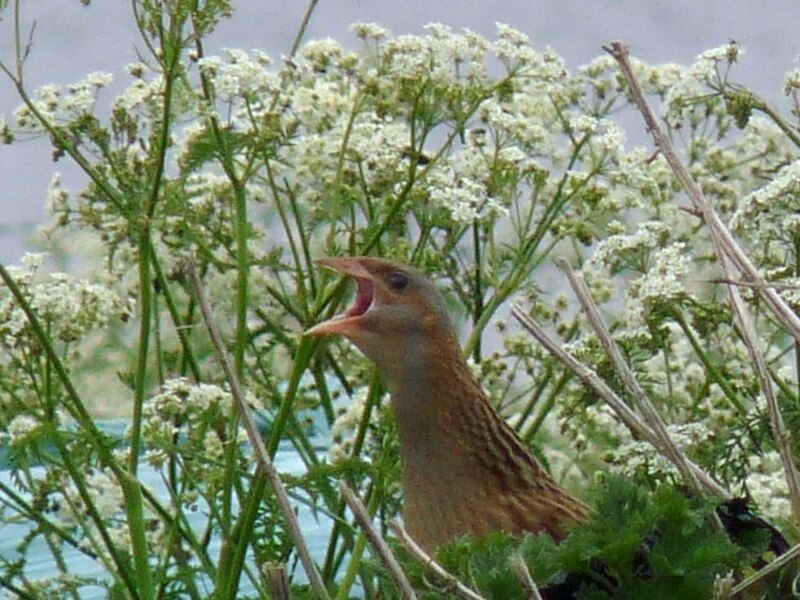 Description: SCP-2337 is a male corn crake2. It is sapient, sentient, and capable of speech. All of its vocalizations are extremely loud, with a minimum observed volume of 90 dB and a maximum of [REDACTED]. Though this can and has caused damage to personnel's hearing, SCP-2337 is oblivious of its ability and is generally friendly with Foundation personnel. SCP-2337's vocalizations take the form of a language tangentially related to English. It often appears to be word salad, but, upon closer inspection, can have meaning in English through a series of vague innuendos, metaphors, rhyme, and arbitrary insertions of the word "cack". As such, SCP-2337 will answer to the name "Dr. Spanko." Initial reports of SCP-2337 came from unusual noises from a field near ████████, Sussex, UK, which led to its capture in the same area. Upon containment, SCP-2337 appeared to take hostile action against Foundation personnel, emitting blasts of noise that ruptured the eardrums of 3 agents. Upon later examination, it was revealed that SCP-2337 was attempting to make friendly conversation. Addendum: Since the containment of SCP-2337, several sapient creatures contained by the Foundation have displayed knowledge of its existence and have expressed interest in a meeting with SCP-2337. The reason for this has yet to be fully understood, though it is believed that SCP-2337 has some sort of status as an authority figure to several particularly dangerous beings. Keter reclassification has been proposed for this reason, but is currently denied due to SCP-2337's apparent cooperation with the Foundation. Dr. ██████: Please state your name for the record. SCP-2337: Cack! Am christened Herr Doktor Spankoflex. Am colloquially namesplapped with Essy-Pee toothreethree and Steven, am complicate across the state. SCP-2337 draws a prolonged gasp. Dr. ██████: - You seem to have a pre-established relationship of sorts with several of the more dangerous creatures in our custody. Dr. ██████: Yes. Please elaborate on the exact nature of this relationship. SCP-2337: It done be shallforth! Ablesauce am tricky mayonnaise forsooth, aunt Ruth. Come packin' with storebrand hostility cakes for mouthstuff. Slaveykins grew boarded and bearded from Chesapeake Bay to Unknown Kadath, my good flibbert. The three ringed hobo stack, over and over, alakazam. Cack! Dr. ██████: Please repeat that statement in the dialect used by the Foundation. SCP-2337 begins yodeling for three consecutive minutes. Dr. ██████: Please discontinue yodeling. SCP-2337: Am cack more sense? Dr. ██████: We need you to cooperate and explain your answer in a coherent way. SCP-2337: Mitochondria the molasses? Am what the spanglefreezer said, for shame, this! Askulate the right query-cue molasses! Dr. ██████: You're not hearing me, are you? SCP-2337: Only with the Nebraska cack-flip, amigo salad. Cack! SCP-2337: What ho, eastward bound?! Profound disappointment! Dr. ██████: "Snackutations Doctor Spanko, cack! You am authoritater? Explainerate." SCP-2337 begins "cacking" angrily, then proceeds to climb up to Dr. ██████'s face and attempt to peck his eyes out. SCP-2337 is quickly sedated with a tranquilizer dart and Dr. ██████ suffers only minor scratches. This has been noted the only time that SCP-2337 has displayed hostility. 1. SCP-2337 calls them "stranglefruits."